Hydrology project is taken up in November 1995 with the help of World Bank under credit No. 2774-IN. 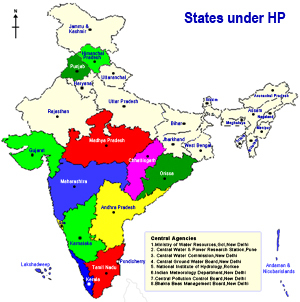 The prime objective is to develop sustainable Hydrological Information System (HIS) for the participating 13 States & 8 central agencies including Maharashtra state in India. The Hydrological Information System comprises hydro meteorological monitoring infrastructure and a set of easily accessible comprehensive and user friendly database for data validation, processing, storage, dissemination etc. Consolidation of HP I activities-procurement of Computer peripherals for divisions and sub divisions and inhouse trainings conducted. Awareness raising, dissemination and knowledge sharing- Regional/district level awareness raising workshops and HIN survey conducted. Web site uploading is in progress Audio visual equipments Procured, national study tour conducted. World Bank procurement and FMR trainings imparted to officers. Construction of WQ lab and building in progress for HPD,Thane. Major procurement of WQ lab is completed. Vehicles 3 cars and 6 Tata Spacio procured. Decision support System- Upper Bhima Basin is selected as a pilot study. Required data is submitted to consultant. Purpose Driven Study-2 topics are approved by MOWR and their work is in progress. Optimisation of G & D stations network of HP,Maharashtra. Effect of changing water allocation in Nath Sagar project Jaykwadi Dam, Paithan, District Aurangabad.